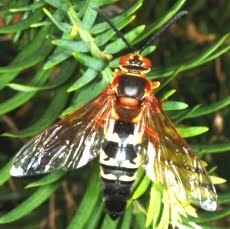 Tis the season for cicada killers, the large wasp that looks as if you can saddle and ride it into town. Cicada killers over winter int he soil and emerge around this time of year, late June or early July. These ground nesting bees are no doubt intimidating and if you are unfortunate enough to have many of these bees infesting one area you may want to consider calling in the pros to treat the area. They may spray the wasps directly or they may dust the holes with an insecticide dust. If there are only a few wasps and they are not in the way, then I would leave them alone, maybe they will help limit that crazy noise the cicada makes all summer, although, after this years world cup and the horns that accompanied it, we may be used to crazy sounds. "as if you can saddle and ride it into town" Ha, that's classic. Hi Matt, actually if you are going to use chemicals, you really need professionals because you have to get it right! This is not just for stinging insects! The noise makers at the world cup were definitely annoying! I would also recommend letting the pros handle these types of issues. This company is great at dealing with any Pest Control Portland or Pest Control Seattle issues. Hey Mike, just discovered this excellent blog. I had a question on your "mouse in the sofa" post from a couple of years ago, which I presented by email. I'm also leaving it as a comment on the item in question. Thanks again. I agree with letting the pros handle these noisy situations. Hate it when even mosquitoes buzz around at night let alone these large wasps. I love the idea of saddling a wasp and riding. I agree such pests are best handeled by experts.